Hi All and welcome to a simple yet fun card playing with Ellen Hudson Botanicals stampset. I loved playing with this colour combination as I feel this is such a classy combo. Here in Australia we are celebrating Mother's Day so that is the reason for the extra blog post and video process. 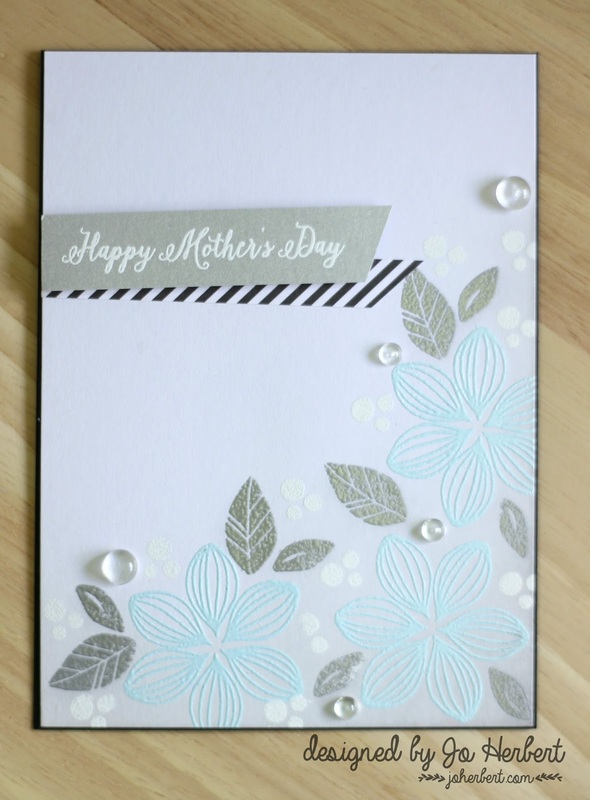 I have first heat embossed the floral image with Metalline First Frost, then the leaves with Metallic Silver and added the circles with white embossing powders. Making the focus being on the bottom right hand side so I can place the sentiment towards the top left. To make the embossing pop that little more extra I have ink blended with Distress Oxide Hickory smoke ink with a very light hand then wiping excess ink off with a tissue. It is a subtle technique but effective for heat resisting. To finish the card off I have added some Pretty Pink Posh clear droplets in various sizes. I have created a process video of today's card creation. Hope you enjoyed today's bonus card creation.